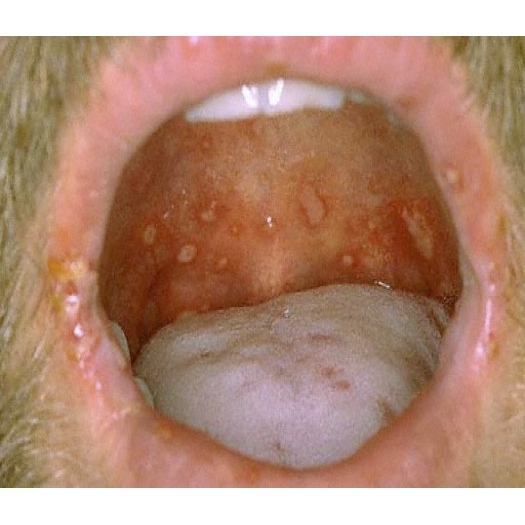 Patient's initial presentation was pharyngitis with no rash or lesions present; no other symptoms. Was not restricted from practice nor access to training facilities. At 24 hours, he presented with ulcerations on the soft palate and a painful maculopapular rash on his hands involving the palms. At this point, he was advised to practice good hand hygiene, but was not isolated and was allowed to continue to practice. Based on clinical presentation and history of exposure, Hand, Foot, and Mouth Disease (HFMD) was the working diagnosis. Three additional cases were identified over the next 6 days. With the advent of these new cases, isolation precautions were taken while the athletes were in common areas, such as locker rooms, dining halls, and meetings. Infected athletes were instructed to wear N-95 masks and gloves, were educated on proper hand hygiene, and given personal bottles of hand sanitizer. The affected members of the team, however, were allowed to continue to practice. Within 24 hours (day 7), there were two new cases and infected athletes were quarantined at an off campus facility and removed from practice and team activities. From day 7 forward, any players presenting with cold type symptoms were quarantined for 48 hours regardless if a rash was present. Those players were evaluated by a member of the medical staff on a daily basis. On Day 8, a letter was sent out to the athletic department regarding the outbreak informing staff about the diagnosis and its highly contagious nature, current treatment, signs and symptoms, and isolation precautions, if acquired. Vital Signs - Temp: 100.8 with other signs found to be within normal limits. Derm - Intact macular lesions on an erythematous base that are tender to palpation on bilateral hands Case Photo #1 and soles of the feet. Click here to continue. Challenge yourself by writing down a broad differential diagnosis before moving to the next slide. NOTE: For more information, please contact the AMSSM, 11639 Earnshaw, Overland Park, KS 66210, (913) 327-1415.